Disney’s new take on the Winnie the Pooh property is a gentle, melancholic reminder that we should all relax once in a while. This summer-blockbuster season has presented audiences with several horrifying, apocalyptic scenarios: Thanos gathering his infinity stones, terrorists threatening nuclear war, dinosaurs running rampant around the planet. But nothing this year sent me into a spiral of existential dread as much as the revelation that adult Christopher Robin (Ewan McGregor), the protagonist of the Winnie-the-Pooh books, isn’t taking enough vacation. The setting is postwar Britain, and the premise of Disney’s film (directed by Marc Forster) is similar to Hook in that the main character of a beloved children’s series has grown up and forgotten the whimsical wonder of his youth. Beyond that: Christopher Robin has neglected the transformative power of taking time off from work. This is a crisis that simply cannot stand, and Christopher Robin sets about fixing it by reintroducing the cherished animals he used to spend his summers playing with in the semi-mythic Hundred Acre Wood. Rather than the colorful cartoons of earlier Disney Winnie the Pooh entries, these creatures are now three-dimensional beings, most of them resembling living dolls, with Pooh possessed of a particularly blank, baleful stare. “Nothing comes from nothing,” the grown-up Christopher is fond of saying in a chiding tone, but he’s clearly wrong—one can interpret quite a lot from Pooh’s expressionless gaze. It is hard to know who exactly Christopher Robin was made for. The screenplay is credited to three people: the wonderfully acerbic indie writer/director Alex Ross Perry, the Oscar-winning Tom McCarthy (director/co-writer of Spotlight), and the Hidden Figures writer Allison Schroeder. Together, they’ve made a film that is perhaps too elegiac and gloomy for children, but also too straightforwardly fanciful for their parents. It’s an odd, melancholic experience that at times recalls Terrence Malick as it does A. A. Milne, but there will certainly be some viewers in its exact wheelhouse, and I was one of them. 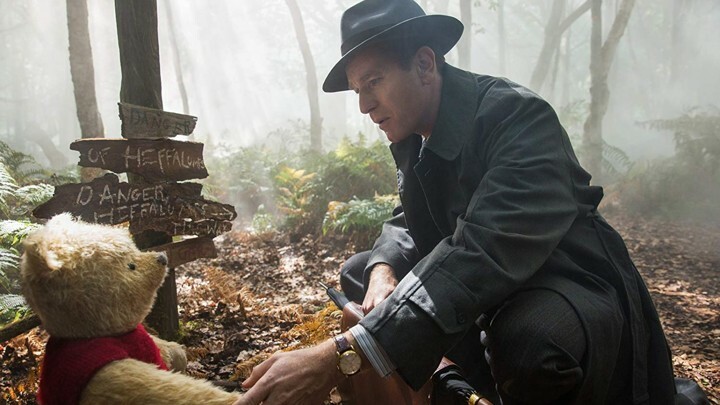 The setting is a great help in terms of selling Christopher Robin’s somber tone and formulaic setup. After a prologue centered on a young Christopher (Orton O’Brien) having one last big adventure with his animal friends, a montage depicts his tough passage into adulthood. He’s packed off to boarding school, his father dies (offscreen) before Christopher has entered his teenage years, and then he fights in World War II like so many of his countrymen, while his wife, Evelyn (Hayley Atwell), raises their daughter, Madeline (Bronte Carmichael), on the home front. The film is set a few years after that. Madeline is a bright if serious-minded young girl, and Christopher works endless days and nights at a luggage company in London trying to find cost efficiencies for his posh twit of a boss Giles Winslow (Mark Gatiss). As such, his family has fallen by the wayside, and they have to weekend at his childhood countryside getaway without him. Oh, bother! The only solution is for Pooh (voiced by Jim Cummings) to wake from his long slumber and stumble into the real world, first demanding that Christopher help him find his other friends (Eeyore, Tigger, Kanga, and the rest of the animal gang), and then working to shake him out of his bourgeois reverie. The film will likely draw comparison to the ongoing Paddington series, another bear-focused bit of charming British storytelling. But that is a contemporary retelling of a children’s classic with a broad metaphor about how the power of community spirit is magnified by the acceptance of outsiders. Winnie the Pooh, who by his own admittance is a bear of “very little brain” and is mostly focused on having fun and being with his friends, exists to remind everyone to take a break once in a while. “People say nothing is impossible, but I do nothing every day,” he muses to Christopher. He, like Paddington, should be regarded as a hero. The best chunk of the film is the first act, in which Pooh wanders around postwar London, baffled at all the work everyone has to do (“Why is he in a cage?” he asks about a ticket-taker at the train station). Christopher has become quite the stolid grump, but Pooh has no time for grumpiness; he barely seems to understand what it is, instead responding to each of Christopher’s exasperated sighs with his trademark solipsistic maxims. “That’s a silly explanation,” Christopher grumbles as Pooh explains how he managed to appear in the real world. “Why thank you,” Pooh replies. Quickly enough, the barricades Christopher has built in his mind against any kind of capricious thinking begin to tumble, and his other friends appear—there’s the morose Eeyore (Brad Garrett), the energetic Tigger (Cummings again), the timid Piglet (Nick Mohammed), the comforting Kanga (Sophie Okonedo), and the nervy Rabbit (Peter Capaldi). Somewhat bizarrely, the characters who were based on stuffed animals (owned by the real Christopher Robin, the son of A. A. Milne) are animated as living toys, while those that weren’t, like Rabbit and Owl (Toby Jones), look like real creatures. The material in the Hundred Acre Wood is at times eerie (its landscape is dead and overgrown until Christopher returns), though that part of the story stays true to the notion that the frightening Heffalumps and Woozles are simply conjured from Piglet’s and Pooh’s feverish imagination. The stuff in the real world is a little more chaotic, and there’s one car-chase sequence that felt like action for action’s sake (above all else, Pooh should be a gentle franchise). But I’ll forgive those flourishes in light of this movie’s essential calmness; in Christopher Robin, the elemental joy of carrying a red balloon is given equal weight as the particulars of Christopher’s job. I’m not quite sure which madman at Disney gave the green light to a movie that uses the Winnie the Pooh series as a way into the emotional drudgery of Britain’s returning soldiers. Christopher Robin is the kind of uncanny experiment that only gets to happen in children’s films once every few years. But any time that underlying weirdness threatens to overwhelm everything, Pooh is there to urge the viewer not to stress—a message that, especially in 2018, couldn’t be more helpful.